For non-human cannibalism, see Cannibalism in animals. Cannibalism is where a person eats the flesh of another person. It is also called anthropophagy. Anthropologists are not sure how widespread it was, but it did happen in some societies. The word 'cannibalism' comes from the Island Carib people of the Lesser Antilles. They got a long-standing reputation as cannibals when their legends were recorded in the 17th century. Some controversy exists over the accuracy of these legends. Cannibalism was widespread in the past among humans in many parts of the world, continuing into the 19th century in some isolated South Pacific cultures, and to the present day in parts of tropical Africa. Cannibalism was certainly practiced in New Guinea and in parts of the Solomon Islands, and flesh markets existed in some parts of Melanesia. Fiji was once known as the 'Cannibal Isles'. Cannibalism has been well documented around the world, from Fiji to the Amazon Basin to the Congo to Māori New Zealand. The cannibalism paradigm: assessing contact period ethnohistorical discourse, by James Q. Jacobs. 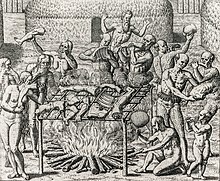 A critical, academic review of Mesoamerican cannibalism claims.